Fall is officially here and it’s time to put away your bikinis and grab your favorite sweater. 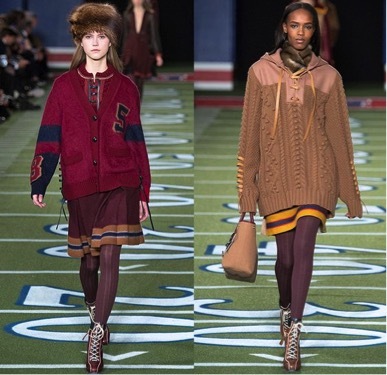 Along with the opportunity to wear amazing boots and outerwear, the Fall season also brings with it a time that many of us dread … Sports Season! Football has started, basketball starts soon, and baseball is in its playoff season. Dressing for sporting events is tricky because you want to maintain your sense of style, but still look appropriate for the event. To make things even worse, each type of sporting event has its own unique vibe in terms of fashion. DO NOT wear a dress or skirt to any sporting event with stadium seats. 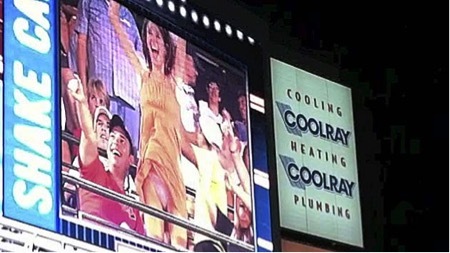 You do not want to end up on the Jumbotron like this! Outfit Suggestions: Leather pants and an oversized sweater; Jeans with a tee and your best bomber. Basketball games provide the greatest opportunity for style (think WAGS). While other sports may require you to wear a jersey for your team, basketball does not. In fact, women at basketball games tend to dress more stylishly than other events so dress for a basketball game like you would if you were meeting friends out for cocktails! Outfit Suggestions: Jeans and a tee shirt or sweater (if you’re feeling extra sporty – choose a top with the same color as your team); Your favorite sneaks and a hoodie for an extra casual look. Outfit Suggestions: Ski pants (or those with similar warmth), wool sweaters, fur-lined caps and a down jacket. Ladies, the name of the game is warmth! Your boyfriend is not going to want to leave after the first quarter and football takes forever. Seriously, these games take at least three hours. And in most cities you’re supposed to sit outside in the cold and be happy about it! The very least you can do is allow yourself not to be miserably cold while you’re sitting there. I recommend your favorite ski gear. Dress how you would for Après Ski. Whether you’re attending a sports event this season as a fan or as a favor, dressing for the event – as you would dress for any other event in your life – will make you feel like a winner (even if your team isn’t)!